Italy is made up of 20 regions, each with distinctive characteristics. Here, you’ll get an overview of Emilia-Romagna to get you started on planning an Emilia-Romagna trip. The region of Emilia-Romagna is one of Italy’s largest, both in terms of area and population, as well as wealthiest. It’s also one of the country’s gastronomically rich regions, which is saying something in a country so focused on food. This large region in northern Italy was once two regions (hence the hyphenated name) that, when combined, stretch across almost the whole width of the peninsula. There’s an incredible amount of geographic diversity with a region as big as Emilia-Romagna, including mountains, plains, and hills. The region features popular beaches, gorgeous mosaics, car museums, and an historic university – not to mention a city-state enclave within its borders. The Italian and English names for Emilia-Romagna are the same, and it’s pronounced eh|MEEL|yah roh|MAHN|yah. The demonym for people or things from Emilia-Romagna differs depending on whether they’re from the Emilia portion or the Romagna portion. The demonym for Emilia is emiliano (masculine singular), emiliana (feminine singular), emiliani (masculine plural), or emiliane (feminine plural). The demonym for Romagna is romagnolo (masculine singular), romagnola (feminine singular), romagnoli (masculine plural), or romagnole (feminine plural). The capital of Emilia-Romagna is Bologna. Emilia-Romagna is in northern Italy and shares borders with the regions of Veneto and Lombardy to the north, Piedmont to the west, Liguria to the west and south, and Tuscany and Le Marche to the south. It also has a stretch of coastline alone the Adriatic Sea. San Marino is a microstate enclave in the northern part of Emilia-Romagna. There are three UNESCO World Heritage Sites in Emilia-Romagna – the Piazza Grande, Torre Civica, and Cathedral in Modena; the historic city of Ferrara and the Po Delta; and Ravenna’s early Christian monuments. 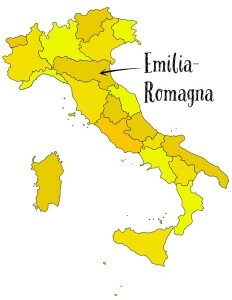 Emilia-Romagna cuts across the Italian peninsula right about where it starts to fan out from the rest of Europe. The region includes a piece of the Apennine Mountains that run down the center of the country, but it’s primarily flat. Italy’s longest river runs along the border between Emilia-Romagna and Veneto, spilling into the Adriatic Sea in a massive regional park and protected area. And with all that natural beauty, Emilia-Romagna is also home to some fantastic and fascinating cities. The capital of Bologna has the oldest continuously-operated university in the world. Nearby Modena is where true balsamic vinegar is made. Parma gave the world such delicacies as prosciutto and parmigiano-reggiano. Some of the best Byzantine mosaics in the world are in Ravenna. Ferrari, Lamborghini, and Ducati all have factories – and museums – in Emilia-Romagna. It’s the kind of place that offers plenty of diversions for travelers almost regardless of your interests. Getting to the main cities in Emilia-Romagna by train is easy (Bologna is on the high-speed rail lines), but some of the smaller towns are difficult to reach without a car. (The same goes for some of the car factories and museums.) Look into local and regional buses if you don’t want to rent a car for your stay, or perhaps a guided tour of a town you’d like to visit. Note that while Emilia-Romagna isn’t as popular a region for visitors as, say, Tuscany, that doesn’t mean it’s off the tourist radar. Not only that, with major universities in Bologna and Parma there’s a healthy international student population in those cities almost year-round. You may not find as many kitschy shops or postcard stands as you will in Venice, nor as many people who speak English, but you’ll certainly eat well.